Day 170: Come to Daddy! 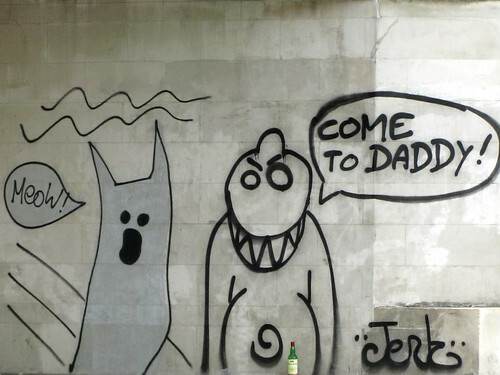 There is a particular humour to this rather basic graffiti found at Bassin de la Villette. “Come to daddy!” says the monster with an evil and gleeful grin. The phantom-y cat knows something’s up and and couldn’t try to escape quickly enough! It is Father’s Day today, and it is a rather poignant day for me. I do not remember any celebration that I may had had with my late father, and at home, it was more of a day where we celebrated it with granddad. However he is no longer with us for another celebration. As I walk the streets of Paris, I’m reminded of us planning a trip for him to visit me here after my move but time ran out on us.